The Landwehr Canal, or Landwehrkanal in German, is a 10.7-kilometre (6.6 mi) long canal parallel to the Spree river in Berlin, Germany, built between 1845 and 1850 according to plans by Peter Joseph Lenné. It connects the upper part of the Spree at the Osthafen (Eastern Harbour) in Friedrichshain with its lower part in Charlottenburg, flowing through Kreuzberg and Tiergarten. Lenné designed a canal with sloped walls, an average width of 20 m (66 ft) at the surface and locks near both ends to control the water depth. In the course of two enlargements (1883–1890 and 1936–1941), it reached a breadth of 22 m (72 ft) and a depth of 2 m (6.6 ft). Today the waterway is mainly used by tourist boats and pleasure craft. In Kreuzberg the canal passes the entrance to the former Luisenstadt Canal that, between 1852 and 1926, provided a further connection to the Spree River. Although this has since been filled and partially converted to a public garden, its route can still be traced by the parallel flanking streets with their distinctive damm suffixes. Further west in Kreuzberg, the canal is paralleled for about 1 kilometre (0.62 mi) by the U1 line of the Berlin U-Bahn, which runs here as an elevated railway. After passing the elevated Möckernbrücke and Hallesches Tor stations, the U1 crosses the canal on a high level bridge that also spans the railway bridge that once gave access to the, now demolished, Anhalter Bahnhof. Shortly after that, the elevated U2 line crosses the canal. After entering Tiergarten, the canal flows between the Großer Tiergarten Park and the Berlin Zoological Garden. Here the canal passes through the Unterschleuse (Lower Lock) and is bridged by the Berlin Stadtbahn. This historic elevated railway carries S-Bahn, Regional-Express and InterCity trains. The Landwehr Canal rejoins the Spree River in Charlottenburg, immediately opposite the entrance to the Charlottenburg Canal at a waterways crossroad known as Spreekreuz. 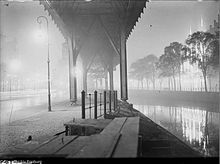 After Rosa Luxemburg was murdered on January 15, 1919, her body was dumped into the Landwehr Canal, where it was not found until June 1. A memorial marks the site. In 1920, Anna "Anastasia" Anderson (Franziska Schanzkowska) attempted suicide by jumping into the water. In 1932, initial construction of the Shell-Haus overlooking the canal was completed. On 27 April 1945, the Russian Army was closing in on the German Army's final defensive stronghold in the Tiergarten district of Berlin. As some Russian troops were using the U-bahn tunnels for their advance, German military engineers, apparently acting on Hitler's direct orders, blew up retaining walls by a railway tunnel adjoining the canal, drowning many civilians and evacuated army casualties (in hospital trains) who were given refuge in the tunnels. On 8 June 1962, a party of fourteen East German refugees commandeered the river steamer Friedrich Wolff, erected steel plates around the wheelhouse and sailed from the Spree into the Landwehr Canal. An East German patrol boat intercepted them and opened fire, but West German police returned fire and all landed safely on the canal bank, in the West. 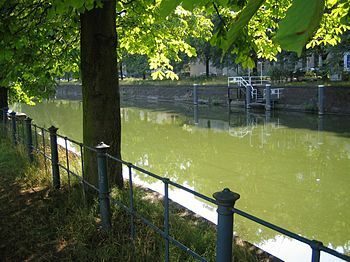 ^ "Landwehrkanal". Berlin – City on the Water. Archived from the original on 2008-06-01. Retrieved 2007-08-05. ^ a b Sheffield, Barry (1995). 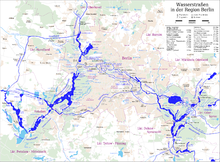 Inland Waterways of Germany. St Ives: Imray Laurie Norie & Wilson. p. 115. ISBN 0-85288-283-1. ^ "Monuments in Berlin – Luisenstädtischer Kanal". Senate Department for Urban Development. Archived from the original on 2011-03-10. Retrieved 2011-01-25. ^ le Tissier, Tony (2008). Berlin battlefield guide : Third Reich & Cold War. Barnsley: Pen & Sword Military. p. 155. ISBN 9781844157662. ^ Müller, Rolf-Dieter; Ueberschär, Gerd (1996). Hitler's War in the East 1941−1945: A Critical Assessment. Oxford: Berghahn. p. 139. ISBN 9781571810687. ^ "Escape By River Steamer Under Fire From Shore". The Times: 8. 9 June 1962. Wikimedia Commons has media related to Landwehrkanal.